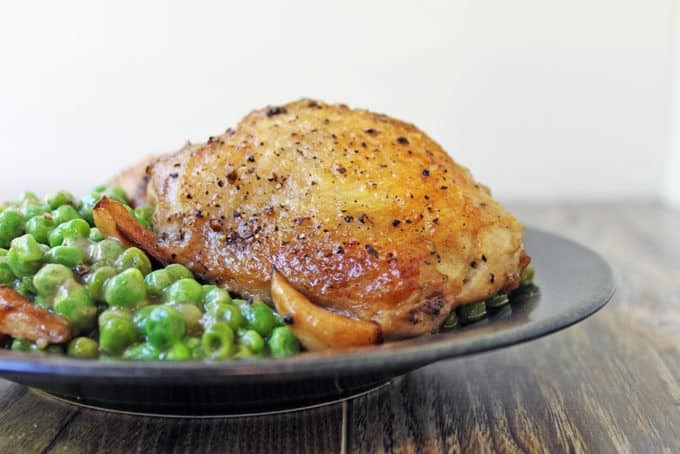 Crispy skinned chicken in a luscious white wine sauce with caramelized garlic and green peas. This is a one pot stove-top meal your family is going to absolutely love! We loved it so much the first time I made it (which was sort of by accident actually! ), I made it again a second time in less than a week so I could share it with all of you. I was standing in front of my refrigerator chanting “I’m not going to the store! I’m not going to the store!” in my head while the kids were taking their afternoon nap. I had chicken and…. yup that was it. Chicken. So I looked in the freezer and found peas. 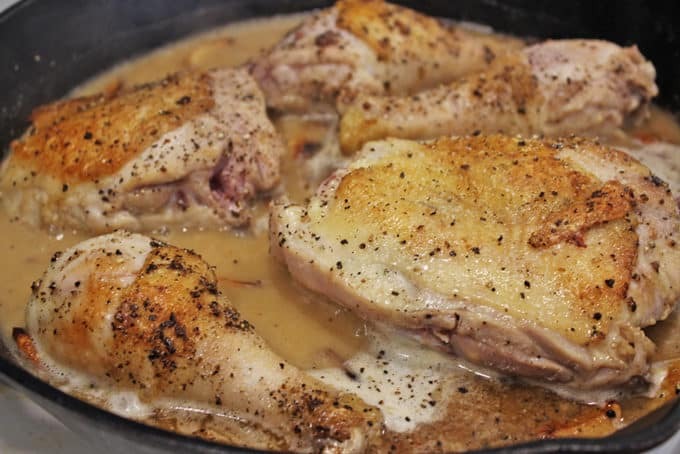 Garlic, white wine and chicken stock (or the Better than Bouillon which I actually use) are always in stock in our house, so I decided to do a quick and easy take on one of my favorite Ina Garten recipes, Chicken with 40 Cloves of Garlic. I would link to it in the actual recipe (I believe very strongly in giving proper credit for recipes I reference/use), but I didn’t even refer to it when making this. I only thought of it because of the combination of flavors, but in my version there is no butter or cognac or heavy cream. The only fat is from the chicken itself. I guess my dish is the light version of that, both on ingredients, calories, and time it takes! One of my favorite things about this meal is that it doesn’t require the use of your oven, which I appreciate since the weather has already started heating up! Let me make a quick disclaimer. I didn’t count salt, pepper and flour in my ingredient list. I hope that isn’t a deterrant for you, I just assumed those ingredients are considered freebies in the ingredient count! 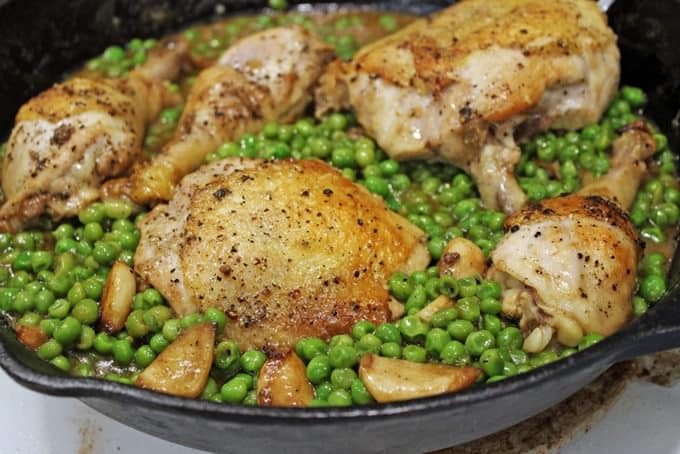 Using a cast iron skillet or any other heavy bottomed pan that is at least 8-9 inches across that you have, start heating up your pan on medium heat. Liberally season the chicken pieces with kosher salt and black pepper. We use a mix of legs and thighs because we are a family of different favorites. Feel free to use all legs or all thighs. Note: You can also easily use white meat if you prefer. Brown the chicken, cooking it all the way through, then remove. Continue cooking the recipe the rest of the way without the chicken. 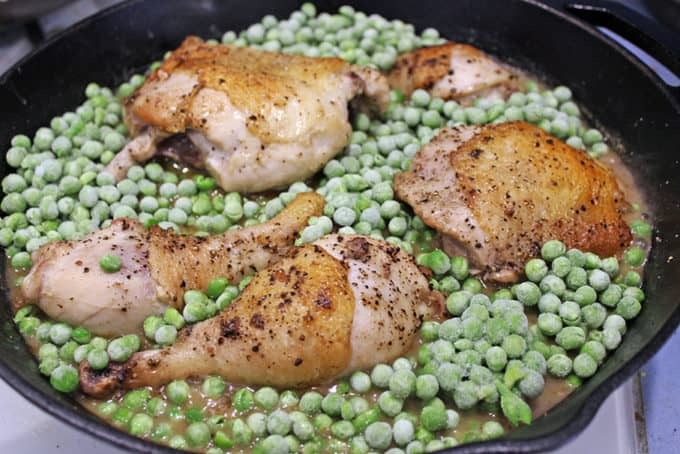 Add the chicken back in when you add the peas. The last thing you want to do is braise white meat chicken. You may not have to cook it for quite as long, maybe only ten minutes for the sauce to reduce, since you aren’t cooking the chicken in it. Put skin side down in the skillet and leave it completely alone for at least 5 minutes. On medium heat, this should render some of the fat out of the skin and give you a nice golden brown color. Turn the chicken and cook for an additional five minutes. You should have some fat in the pan at this point. Take the chicken out for a couple of minutes and put the garlic cloves in the pan. Cook them until they are slightly browned but not dark. Garlic goes from delicious to bitter very quickly. 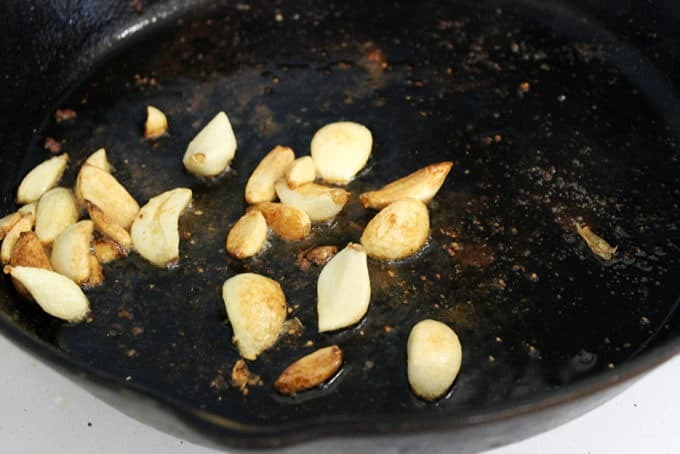 Once the garlic is browning, add the flour into the pan and stir until it is absorbed by the oil. If for some reason you don’t have a couple of tablespoons worth of fat in the pan, you can add in some canola oil here. Both times I have made it, I had plenty in the pan. Add the wine and the chicken broth to the pan. Taste for salt and pepper, add some here if you feel you need more. Add the chicken back in, skin side up. This picture is of the chicken just before the peas go in. Simmer on your stove-top for 15 minutes on medium heat. In the last 2-3 minutes, stir in the peas. Once the peas are warmed up, you’re done! Now you can enjoy your meal a little bit more in your cool house and half empty sink! Happy cooking! 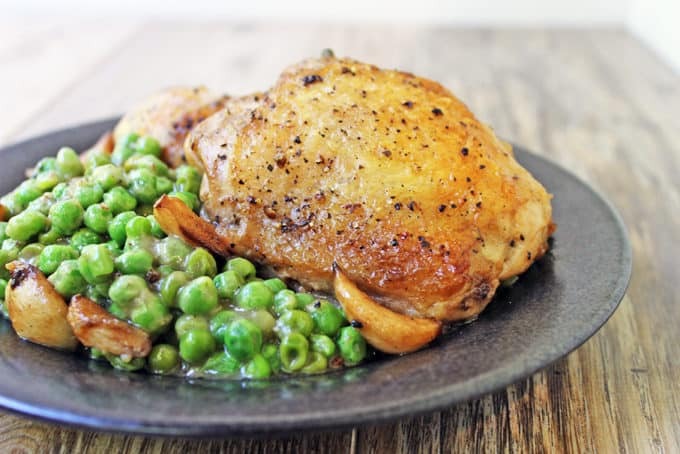 Crispy skinned chicken in a luscious white wine sauce with caramelized garlic and green peas. This is a one pot stove-top meal your family is going to absolutely love! 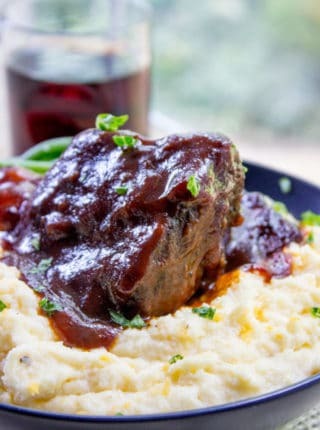 Using a cast iron skillet or any other heavy bottomed pan that is at least 8-9 inches across that you have, start heating up your pan on medium heat. Liberally season the chicken pieces with kosher salt and black pepper. Put skin side down in the skillet and leave it completely alone for at least 5 minutes. On medium heat, this should render some of the fat out of the skin and give you a nice golden brown color. Turn the chicken and cook for an additional five minutes. You should have some fat in the pan at this point. 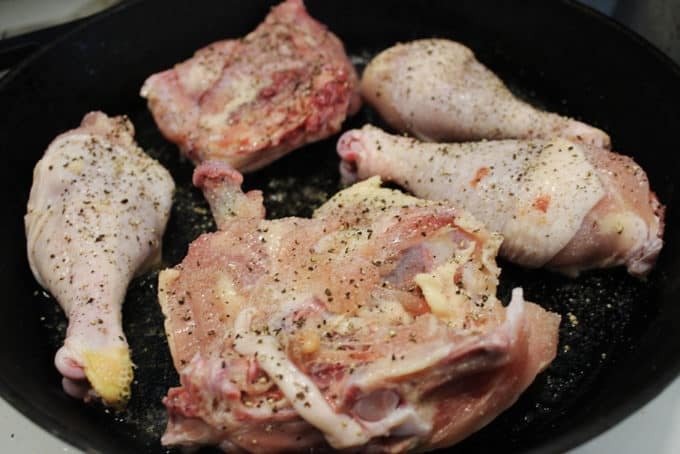 Take the chicken out for a couple of minutes and put the garlic cloves in the pan. Cook them until they are slightly browned but not dark. Garlic goes from delicious to bitter very quickly. Once the garlic is browning, add the flour into the pan and stir until it is absorbed by the oil. If for some reason you don't have a couple of tablespoons worth of fat in the pan, you can add in some canola oil here. Both times I have made it, I had plenty in the pan. Add the wine and the chicken broth to the pan. Taste for salt and pepper, add some here if you feel you need more. Add the chicken back in, skin side up. The liquids should only go up about 2/3 of the chicken. Simmer on your stovetop for 20 minutes on medium heat. Stir in the peas, and continue to cook for another 3-5 minutes. Note: You can also easily use white meat if you prefer. Brown the chicken, cooking it all the way through, then remove. Continue cooking the recipe the rest of the way without the chicken. 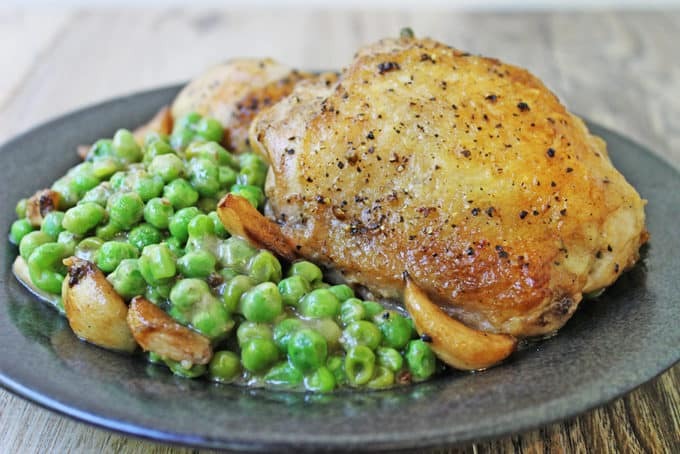 Add the chicken back in when you add the peas. The last thing you want to do is braise white meat chicken. You may not have to cook it for quite as long, maybe only ten minutes for the sauce to reduce, since you aren't cooking the chicken in it. I made this the night before last and it was delicious, I did not add the peas at the end because I don’t like them, but it was still favorable chicken. Really easy to make also. How sweet of you to say Lauren! Thank you so much!! 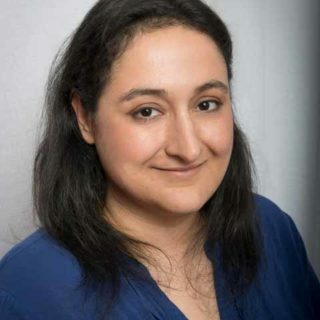 I LOVE your recipes BUT………… I’m on WW and cannot calculate the point value without the Nutritional information and NONE of your recipes have that info !! Christina, so sorry for the lack of nutritional info. When I used to do WW and recipes didn’t have them, I created the recipe in the online WW account or just added the points of each ingredient together and divided by number of servings. Adding the nutritional content to the recipes is just not something I do on this site. I know many light recipe blogs add them though, I think skinnytaste is one I used to read a lot when I needed WW friendly recipes. I think she actually even adds the WW points to every recipe too. I am glad you love the recipes, but my attempts at adding the nutritional content has been super buggy and I scratched it about a month in. Anything that is garlicky is a winner in my book! This looks wonderful! Thanks! If you love garlic, you’ll love this dish! Yummy. Your meal looks so delicious. You did a great job with the photography too. I wish it wasn’t so late at night I would run out and get some chicken. I’m feeling hungry now after seeing your creation. Aww that is so sweet. Thank you! I am trying so hard to learn more and more about food photography! This sounds and looks wonderful, great job with the pictures! Thanks so much! I am trying to get better every day. It is amazing how little things are making the photos better and better! 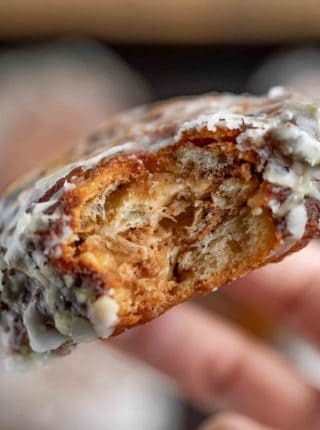 This looks absolutely delicious. My boys love peas and chicken. The husband and I were just looking for new chicken recipes the other day. I think this is one we could totally do! I’m all for simple recipes that pack tons of flavor and it looks like your 5ish ingredient chicken fits the bill! I hope you guys love it! My husband has a fridge full of food and asked me where this dish was. I call that a win, some of the other dishes were his favorites! Oh, that looks so good. I love garlic and I love when chicken gets crispy! Minus the peas, I would eat this. I am not sure what my issue with peas is, but I wonder what I could replace peas with? 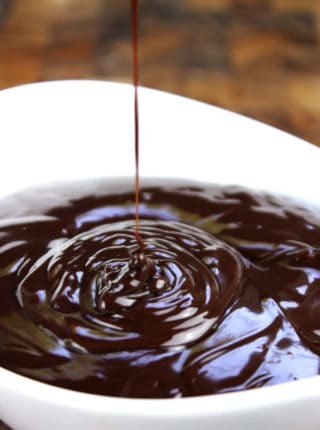 Otherwise this is yummmmmmmy looking! This dish looks like a classic for Sunday dinner! Crispy chicken is certainly a must for me. You and me both, crispy chicken skin is amazing! 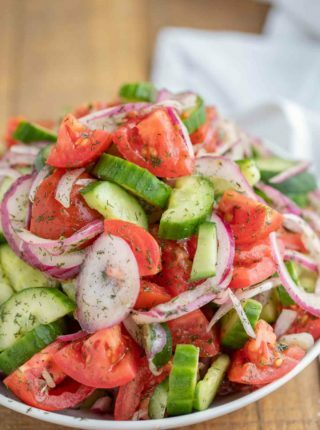 This dish looks amazing! I am pinning for later! Thank you for the pin! I hope you love it!